Come celebrate my friends birthdays! 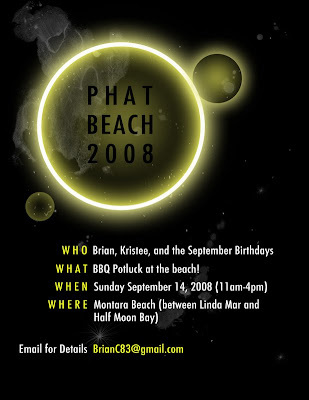 Brian and Kristee are having they’re annual joint birthday party, next Sunday at Montara Beach. So girls, get out that cute bikini to tan in and guys, don’t forget your tiny shorts! It’s a potluck so bring some food to share! Skimboards, waterguns, etc. Holla at Bri-Fi if you have any questions! sounds like whoevers throwing that shindig must be hot and buffer than fernando!